The summer school will be held in the Buys Ballot Gebouw (Buys Ballot Building) on the Utrecht Science Park, De Uithof. The lectures will be in room 023; the labs will be in room 228 of the Koningsberger building. Lunches, registration and coffee breaks will be held in the coffee room on the fifth floor of the Buys Ballot Building. When traveling by public transportation from Utrecht Central Station to the Uithof, you can take either bus 12 to bus stop Padualaan or bus 28/128 to bus stop Botanische Tuinen. At both stops, you should be able to see the following buildings just beyond the bus stop. The Buys Ballot Gebouw is the large building with the large Universiteit Utrecht logo on the roof. Note that you cannot enter the building directly. 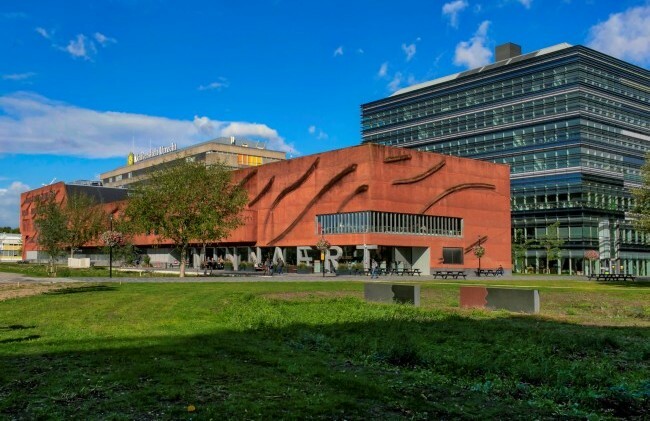 You may need to enter through the Minnaert building (the low red building in front of the Buys Ballot Building) or the Koningsberger building (the glass building to the right of the Buys Ballot Building). Although you can pay for your bus tickets on the bus, it might be a good idea to purchase an OV chipkaart which lets you pay by swiping your card. Fares are typically a bit cheaper when paid with a chipkaart as opposed to cash on the bus. You can find more information about the OV chipkaart online.